Charles Assuming the ladder south-east is bad for White, Black may emerge with . Now what does the knight's move net with achieve? ... go the other way! These Black stones are able to squirm and escape if they are really important. White may be cut in many places, but White's stones are stronger at the top and to the right. 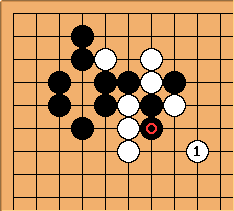 (From what I can see) Black has a choice to either save these Black stones or ignore their plight and make use of their aji. 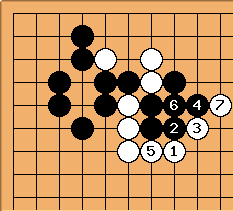 As can be easily seen, a Black play at "a" will let Black escape his cutting stones. 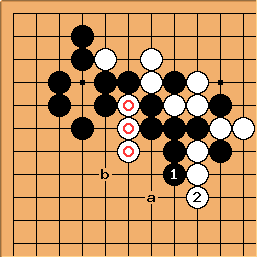 The White circled stones are almost captured themselves (but not quite yet) with a possible refute at "b". 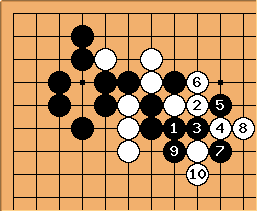 We need to ask ourselves if Blacks' commitment to save these stones lets White play important moves on the left side of the board if White use the marked stones as a sacrifice instead. 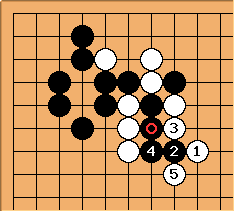 Question: Before trying to rescue them with move 1 in "Diagram Squirm" -- Can Black sacrifice the stones in a way to threaten killing the White stones? Depending on the overall board position it is also possible that this variation is playable for W.